Emergency situations pose a significant threat to the health, safety, and well-being of those nearby. These incidents can occur at anytime, anywhere, with little or no warning. While the Department of Public Safety is committed to providing a safe and secure campus environment, it is important to remember that safety is a shared responsibility of everyone at Portland Community College (PCC). Help prevent and reduce the harmful effects of emergencies by following these simple steps: be vigilant; sign up for PCC Alerts, review campus safety procedures; and report any suspicious, criminal, and/or hazardous behavior. In case of emergency call: 971-722-4444 or 911. Every day an infinite number of crisis situations occur, such as motor vehicle accidents, structural fires, medical emergencies, etc. Typically these incidents are managed by local first responders and affect only a small segment of the population. Occasionally however, emergencies occur that exceed local capabilities and require additional assistance from neighboring jurisdictions, or even state/federal governments. Because these incidents are much larger in scale it is often very time consuming to determine, 1) exactly where emergency assistance is needed, 2) what type of emergency assistance is needed, and 3) how to physically acquire and disseminate emergency resources. As a result, many individuals spend an indefinite period of time being self-reliant. Hence, it is much wiser to prepare for an emergency than it is to be unprepared for them when they do strike. So, how do you go about preparing for the worst? The best advice is to keep it simple. First, familiarize yourself with the most likely hazards to occur in the area where you spend the greatest amount time, such as where you live and work. Then make a list of the essential items you could not live without, and the specific actions you would take if these crisis situations cause an emergency which overwhelms your ability to cope with them. The third step is to take action; sign up for emergency notifications, develop your plan, and create a “go bag” by assembling as many items as possible from the list you developed above. Finally, commit to developing your emergency preparedness skills now rather than later. No one expects you to create a go bag or become a “prepper” overnight. The important thing is to take emergency preparedness planning seriously and update it as situations warrant. 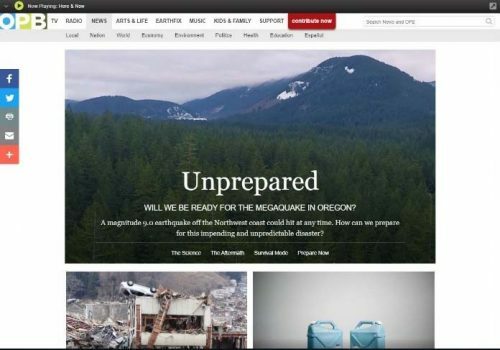 Let’s get started… Here in the Pacific Northwest there a number of both natural and man-made situations that can at any time result in a disaster. For hazard-specific information and practical tips to help you prepare, simply click on the appropriate hazard listed below. Floods are the most common and costliest natural disaster to occur. 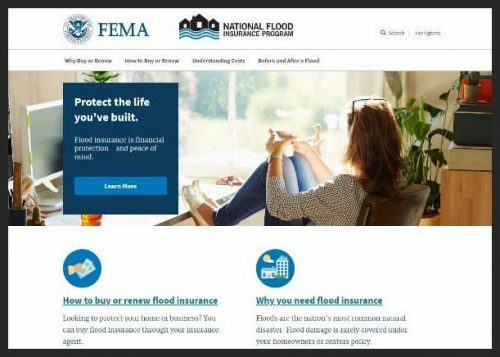 Each year, billions of dollars are spent in the U.S. on flood related damages. Fortunately, most floods take hours or even days to develop, allowing residents sufficient time to prepare and/or evacuate. Flash floods, however, occur suddenly when heavy rainfall exceeds the absorption capacity of soil. 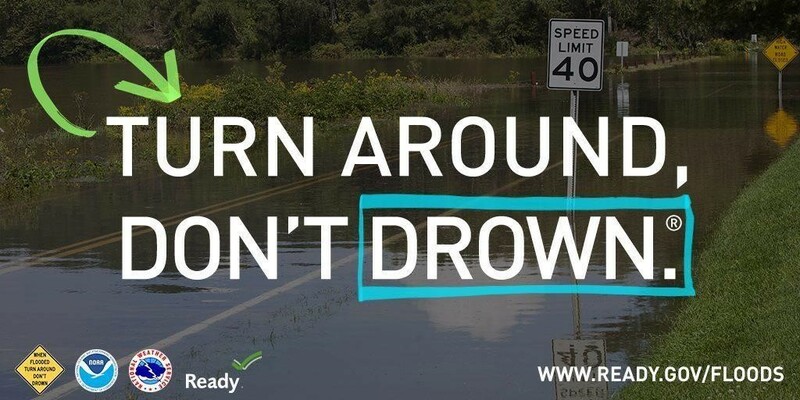 Immediate flood-related hazards include injuries, drownings, hypothermia, and electrocution from downed power lines. Of course, floods pose a number of residual risks as well. One example, is the increased transmission of communicable diseases. A lot of people assume that floodwater and rainwater are the same, when in reality, flood water is often contaminated with pathogens, raw sewage, fuel, pesticides, sharp objects, and other harmful materials. Stagnant water is also an excellent breeding ground for disease-transmitting mosquitoes. 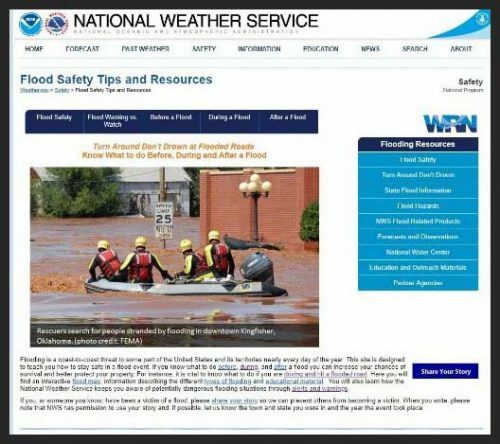 For more flood safety information click on the images below. Earthquakes are caused by the sudden lateral or vertical movement of colliding rock within the Earth’s crust. This abrupt release of friction causes the earth’s surface to shake, sometimes violently. As a result, this can cause structures to collapse, objects to fall and break, gas and power lines to rupture, dams and levees to fail, liquefaction to occur, and tsunamis to take place. Needless to say, earthquakes can be very dangerous! Here in the Pacific Northwest, many scientist believe that a megathrust earthquake along the Cascadia Subduction Zone is overdue. 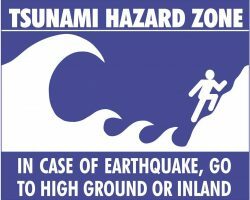 For those of you who did not know, the Cascadia Subduction Zone is just off the coast to our west, and megathrust earthquakes are said to be the most powerful. Extreme heat becomes a concern when external temperatures hinder the body’s ability to regulate internal temperatures. 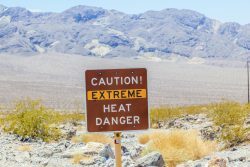 Excessive heat is not only discomforting, it can cause significant health concerns, which in extreme cases, can lead to unconsciousness or even death. Climate scientists have shown that the temperature in the Pacific Northwest has been on the rise and that this trend is expected to continue. These stagnant atmospheric conditions occur when climatic temperatures of 10 degrees or more above average are sustained for a significant period of time. Additionally, in humid conditions evaporation is slowed and the body must work harder to maintain a safe internal temperature. 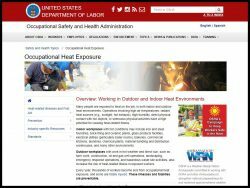 Extreme heat can also occur in enclosed environments such as a confined space where machinery or equipment is generating a large amount of heat, or when confined areas are subjected to radiant or solar heat in which individuals are unable to relocate to cooler conditions. According to the Center for Disease Control and Prevention (CDC), extreme heat results in the death of over 600 people in the United States each year. 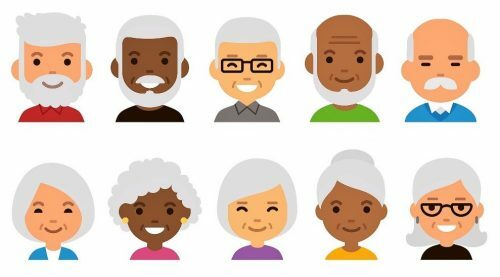 Those most impacted by such harmful effects include younger children, those requiring mobility assistance, those who are ill or overweight, older populations, and pets. To reduce complications related to extreme heat, individuals should limit strenuous activities and exercise to the coolest parts of the day, wear lightweight, loose fitting clothing, drink non-alcoholic beverages frequently, and whenever possible, relocate to areas where fans and air conditioning is utilized. 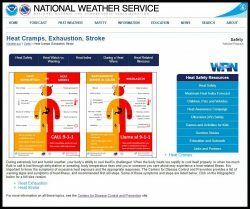 Learn more about how to protect yourself from heat related illness by clicking on the images below. 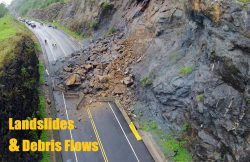 Landslides and debris flows are the downward movement of water, rock, soil, clay and other debris which can not only block roads, highways, and sweep cars and homes away, the tremendously heavy river of ground matter can trap and sweep individuals away as well. 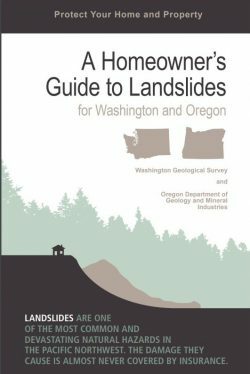 Most people correlate landslides with rainy conditions occurring over sloping land with little or no vegetation to stabilize the ground and hold it in place. Snowmelt over porous soil also triggers landslides which can travel miles from the source of the melting ice. Warming climatic conditions and greenhouse gasses also contribute to the changes that leave the earth vulnerable in much the same way. Thawing permafrost resulting from the loss of ice below these frozen land masses results in ground that is unstable and more likely to move during heavy downpours, or when earthquakes, volcanoes, or avalanches occur. 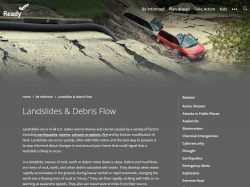 Click on the images below to learn how you can protect yourself from landslides and debris flows. A tsunami is a series of large, vertical waves caused by a massive disturbance to ocean water. Tsunamis are caused by volcanic eruptions, underwater earthquakes or landslides, and meteor impacts. Did you know that 80% of all tsunamis occur along the Pacific “Ring of Fire,” which runs along the coast of Oregon? When tsunamis occur, large waves and the rapid surge of extremely turbulent sea water can move inward for miles causing widespread death and destruction. 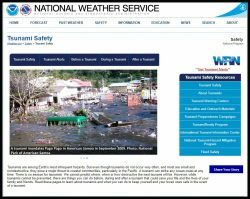 Learn more about tsunami safety by clicking on the images below. Both structural and environmental fires can impact people living in the Portland Metro area. Structural fires are those involving residential, commercial, or industrial buildings. 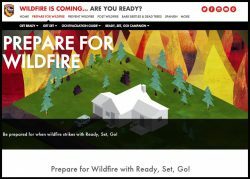 Wildfires typically consume combustible vegetation and are frequently fanned by strong winds allowing them to spread over large areas of land before being contained. 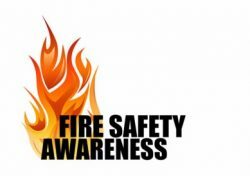 Smoke, heat, and reduced visibility can easily hinder an individual’s efforts to escape from a fire. Likewise, the quality of air in and around these fires can irritate a person’s eyes and cause serious respiratory concerns. 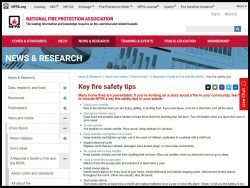 For fire safety information, please click on the images below. Check out our Active Threat Presentation and the video below for more information on how to respond to an active threat on campus. To sign up for emergency notifications from Portland Community College click here! 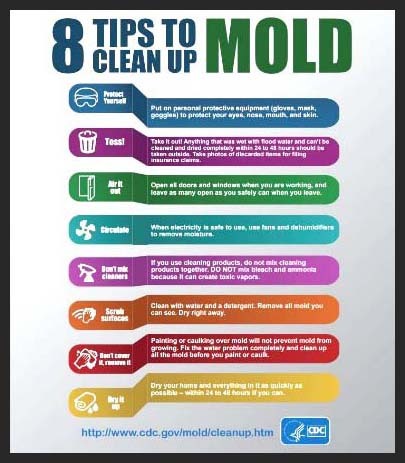 Click on the image below to learn how everyone can prepare for a disaster. 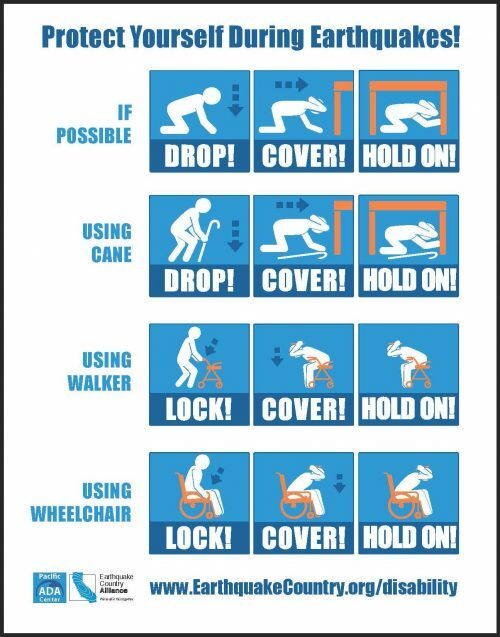 Click on the image below to learn how individuals with access & functional needs can prepare for a disaster. Click on the image below to learn how children can prepare for a disaster. Click on the image below to learn how older adults can prepare for a disaster. Click on the image below to learn how pet owners can prepare for a disaster. Furthermore, all PCC buildings should have a bright yellow “Emergency Guide” booklet located near each stairwell and exit doorway. This guide provides emergency contact information and recommended procedures to follow in the event of an emergency. Please utilize this guides as necessary. For an electronic copy of the Emergency Guide please click here.